There are riches on North High Street in West Chester. Of course, you must dig for them. Some treasures are hidden deeper than others, but each is precious. Many veins offer up one singular prize; other avenues are broad and twisting, and could yield unexpected rewards. Fortunately, there are knowledgeable, friendly guides to help you along the way. The Chester County Historical Society Library is proving a vital stop for those wanting to delve into any kind of local history – and it's particularly invaluable for those interested tracing their family roots. “We do see a lot of genealogists,” said CCHS librarian Jasmine Smith. The library is chock-full of information for even the most novice investigators. Sources include Chester County history publications, family name files, newspaper clippings, church records, census records and maps. There is microfilm, along with CD-ROMs of records and newspapers. There is also a collection of more than 100,000 photographs. The thing all those materials have in common: Chester County. For those who are new to tracking their family and are daunted by where to begin, Smith said they would likely be pointed in the direction of four starting points: Family folders, published genealogies, newspaper clips and the manuscript catalogue. All are alphabetical by last name. “So they’re very accessible resources that, for most people, [will] get them at least some information,” she said. Much of the material in the library is from donations by individuals or family members, but they don’t have to be people of note, just from Chester County. Smith said she never knows what sort of items will be donated. “Someone might call and say, ‘I have this,’ or sometimes people just walk in with boxes. You never really know what’s in those boxes. Or even if you talked to the person beforehand, it’s not what you expected. It’s always sort of a magical mystery of what those things will be. “Generally, what we collect is very location specific,” Smith said. “We want things that are Chester County-related. That’s one of the biggest determiners of what we keep and what we don’t. If we look at something and it’s about Delaware County … it might be a wonderful thing, but that’s not us. “If we are not accepting something, we do explain to people. Sometimes it’s an issue of condition. We also consider what people are actually using, and what we already have. People like to bring in Bibles, but we have a lot of Bibles, and they don’t get used very often. In addition to family donations, the reading room contains books that cover a variety of topics, often linked to exhibits at the CCHS. There are dozens of books written by Chester County authors. “We also have good resources on the Revolutionary War, the Civil War,” Smith said. “We have a good decorative arts collection, to go along with what’s in the museum, if you’re interested in pewter or doll making, or something along those lines. We also have a cemeteries collection, a churches collection. Those are popular with genealogists, but serve another range of interests as well. One of the longest and most labor-intensive projects the library has undertaken is to mount and file thousands of newspaper articles. Although the journalism files start in 1810, it was in the middle of the 20th century when former Historical Society librarians took on the project of clipping items from Chester County publications. After they were clipped, they were stored in boxes until time came for them to be mounted in a manner suitable for filing. The librarians would affix them with a wheat paste, and then use wax paper and a sealing machine to preserve them. At the time, they might not have realized the breadth of their project. Image courtesy Chester County Historical Society This slide from the Photo Archives is from the Dr. Arthur E. James collection. 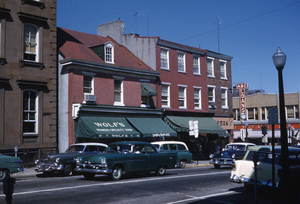 It was taken by James, former Historical Society president, in the late 1950s. It shows North High Street near the corner of Gay Street. “I was told about a box-and-a-half,” she said, laughing at the memory. “Thirty boxes later …” The most senior of the clipping volunteers is Carol Grigson. The East Bradford resident has been working with the material since 1995. Many of the boxes of the clips had been in storage, Grigson said. When it became apparent something had to be done with them, Grigson volunteered for the job. She asked how many boxes there were. Grigson said that at first, she would get any fellow volunteer she could to work on the project, but it was a solitary activity that didn’t suit everyone. It was her idea to gather a group to meet monthly, and the other volunteers “really seem to enjoy it,” she said. The biggest nod to the modern day is that they no longer use wheat paste. “We started using glue sticks,” she said. Adjacent to the reading room is the closed storage room, which is not accessible to visitors, but material stored there can be retrieved by the librarians. Items in this room are fragile or older, and most are stored in archival boxes. “It’s temperature- and humidity-controlled,” Smith said. The collections in closed storage vary, from greeting cards to manuscripts to cancelled checks from long-closed businesses. “Documents here are generally not bound, so they’re more delicate,” she said. Contrary to what might be thought, unlike photographs, cotton gloves aren’t required to handle these items. “You don’t have to wear gloves when you look at them, because gloves make you clumsy and you might rip them. It’s better to handle them with clean, bare hands,” Smith said. Photographs are also kept in closed storage, as the charges of photo archivist Pamela Powell. Powell, who has worked for the CCHS for 30 years, said the most fragile and the most requested photos were being scanned into an in-house database. “You can just sit down and look at pictures of old West Chester or trains or covered bridges or the Brandywine [Creek],” she said. “But for some people, it really is a thrill to see the original. We have people who come from all the way across the country to do their genealogy. They’re sort of on a pilgrimage. And then they find a family reunion photo and see their father in it. It really is exciting for them to see the original, not just look at a computer screen. We can appreciate that. Donations constitute a large part of the photo collection. “We do get a lot of donations,” Powell said. “People get frustrated with their home collections; they might not be sure their grandchildren will be interested. Often a public collection is a good place for that material, then the descendants can all access it. If there’s no identification, sometimes they still accept the photo if the subject is wearing period dress or a costume, for display in the Historical Society’s textile exhibit. Many albums, including ones with daguerreotypes of the 97th Infantry Regiment, which was organized in West Chester during the Civil War. Among those identified are Galusha Pennypacker and Henry Guss, both Colonels of the unit. Powell said Civil War buffs who have similar images are sometimes able to recognize and identify others pictured. Color slides from the 1950s taken by Arthur James, former president of the Historical Society. James walked through West Chester, taking photos of streets and buildings. The images and colors are still clear and vivid. A daguerreotype portrait of Passmore Williamson. An abolitionist and member of the Pennsylvania Anti-Slavery Society, the Chester County native spent more than three months in jail after he helped an African-American woman and her two children escape the man who had enslaved her. Williamson was an abolitionist of some note, and while imprisoned, he had many visitors. Some of the hundreds were well known, including Frederick Douglass and Harriet Tubman. His sign-in visitors book, which is part of the CCHS collection, was the winner of a 2013 crowd-funding campaign, “Pennsylvania’s Top 10 Endangered Artifacts.” The campaign, sponsored by the Conservation Center for Art and Historic Artifacts, raised funds to help preserve the book. “We do have the entire studio [works] of professional photographer Joseph Thompson of Paoli, who did work in the 1950s through 1970s,” Powell said. Thompson, who was the father of the late longtime state Sen. Bob Thompson, followed the political circuit, and among his photos were shots of Richard Nixon and Robert Kennedy when each visited Chester County. “I consider the photo collection an integral part of the library,” Powell said. Librarian Smith said she and her staff will do everything they can to aid someone in their search. “People should not be shy about asking us questions,” Smith said. “They might be surprised about some of the material we have. And if we don’t have something, we’re pretty good about telling you where you might find it.